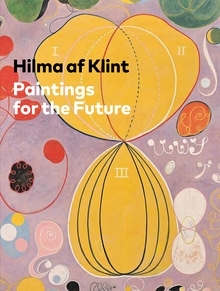 "The Current Standpoint of the Mahatmas" (1920), Hilma af Klint's small canvas from the Series II group of paintings, is reproduced from Paintings for the Future, published to accompany the acclaimed af Klint retrospective currently on view at the Guggenheim. "Despite its consistently diminutive scale," essayist David Max Horowitz writes, "af Klint's output from these years is some of her most incisive. She had by then fully claimed her own artistic voice—a distinctly spiritual one that continued to strive for receptivity over mastery. Spiritualism had positioned her to do so, even in the face of patriarchal social mores that had limited her artistic agency. The liberating potential of her esoteric commitments is aptly, if inadvertently, alluded to in af Klint's notes, when the High Masters declare, 'The world keeps you in fetters; cast them aside.'"